How to paint the figure, no pencil included. The gallery below is from a life drawing session. Click on an image to see them at larger size. Nearly every Thursday I go to Town Hall Arts/Galerie Copper in Copperopolis for life drawing. (It’s uninstructed, but if you live near there, you should attend. It’s a great group and we’re all happy to help if you’re a beginner.) I’ve been doing this for nearly 2 years. Life drawing really helps sharpen my drawing skills. Plus, it’s just plain fun. For the last 6 months I’ve been trying to figure out how watercolor can work for me in life drawing. Last Thursday I didn’t use a pencil at all. It was just me, the model, and brush, paint, water and paper. There are so many things to juggle in my head when I’m painting this way. Not only am I trying to get the proportions right, but I also have to think—all at the same time—about negative space, value, shape, and what trouble the water and paint is going to get into when it hits the paper. I’ve been thinking a lot about giving up my attachment to my end product. Painting this way is a little like I imagine jumping off a cliff in one of those crazy wingsuits would be like. Terrifying and exhilarating. Although if I make a mistake painting, there’s only a pile of chewed up paper and my bloodied ego in a pile on the floor, rather than a broken body. Following the advice of fellow artist, Gayle Lorraine, when I start, I whisper to myself, “Let’s just waste paint and paper today.” It gives me the freedom to screw up, which also means that I work more intuitively, letting what I already know drive my hand. There’s something else about that attitude: I make more work, which means I’m practicing more, entering into more conversations with my materials. And as my mom always told me, practice makes perfect. Although I’m not so worried about perfection. These two sisters are for sale. It’s a small painting on Aquabord, 6″ x 6″, and is unframed. It’s been sprayed with a UV-protective varnish, so you don’t have to put it under glass (although it will need to stay out of sun and bright light so that the colors don’t fade). It’s on a hard board, so you can lean it up on a picture ledge, or frame it. Email me at mockingbirdatmidnight at gmail to purchase. Hoo! I made the grade and was selected to be an exhibiting artist in the project AnimalScapes of the Sierra Nevada Foothills. 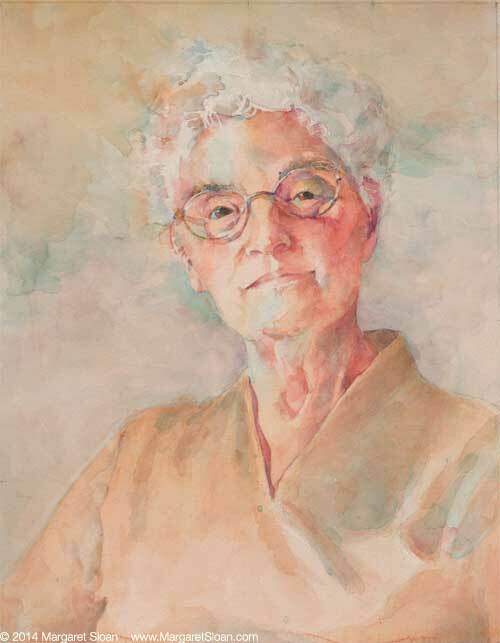 This show, a tri-county project of the Calaveras County Arts Council, Tuolumne County Arts Alliance, and the Amador County Arts Council, will include over 50 artists and makers. 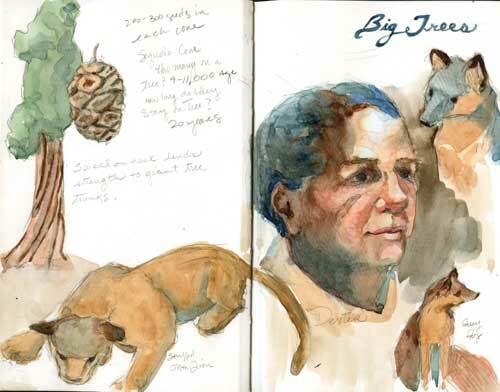 We artists will be creating pieces—paintings, pottery, photos, sculptures, even poetry—that depict animals in the Sierra Foothills, and our works will travel around the three counties in an exhibition to be displayed in 2016. There are many good things about this show. It will raise awareness of the animals that live in the Sierra Nevada Foothills, and publicize animal welfare organizations working in the Foothill communities. I hope that it will increase the human will to protect and care for the other species that live in the area. For our first foray we piled into a big yellow school bus and spent a long day rambling around Calaveras and Alpine Counties. It was great to leave the isolation of the studio and meet other local artists (my people!). First stop was the New Melones Lake Visitor Center & Museum, where rangers led us on a short hike and we spotted an osprey roosting in a tree. The ranger said it was probably a fledgling from last summer’s clutch of chicks raised in the osprey nest built near the center. This trip was like sketching heaven for me, and my pencil was busy the entire time. I tried to catch as much visual information as I could. 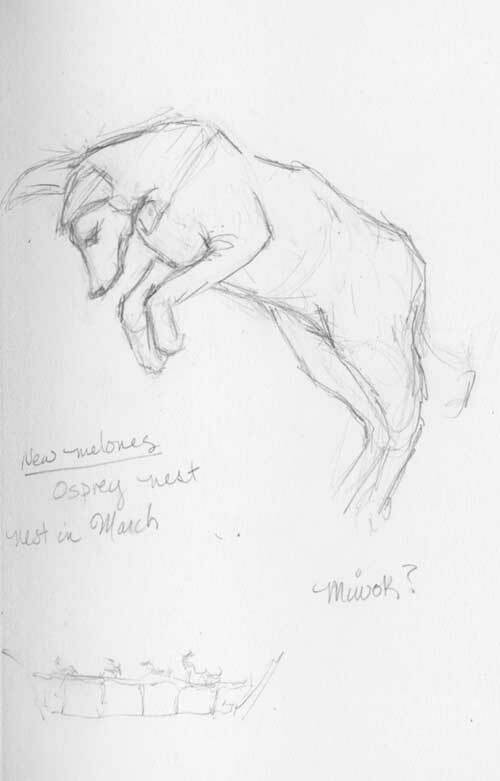 Since the theme of this show is animals, I spent time drawing the taxidermy specimens in the visitor centers. Sketching stuffed animals isn’t as fun as drawing live beasts, but on the bright side, I could really concentrate on understanding perspective, proportions and forms. I’m slowly adding color to the sketches, as there was no time for dragging out watercolors during either tour. 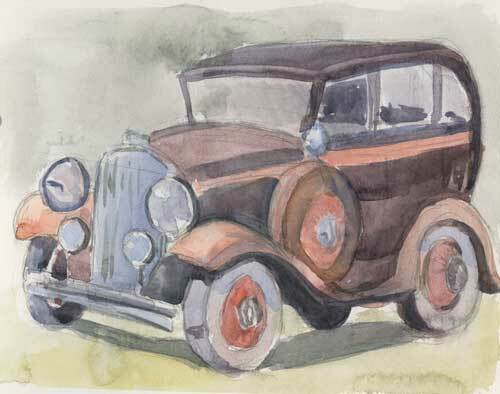 It’s been a great way to experiment with the paint, as I’ve scanned the original pencil sketches to preserve them. 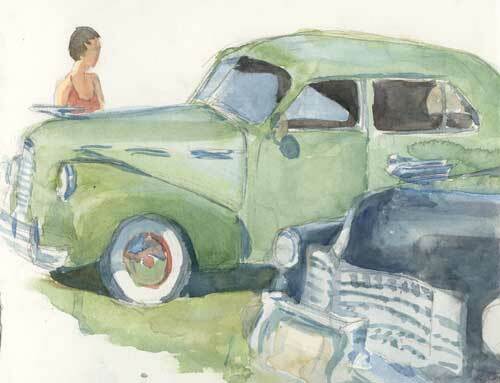 With the sketches safely stored on my computer, I feel like I can take some chances with the paint. 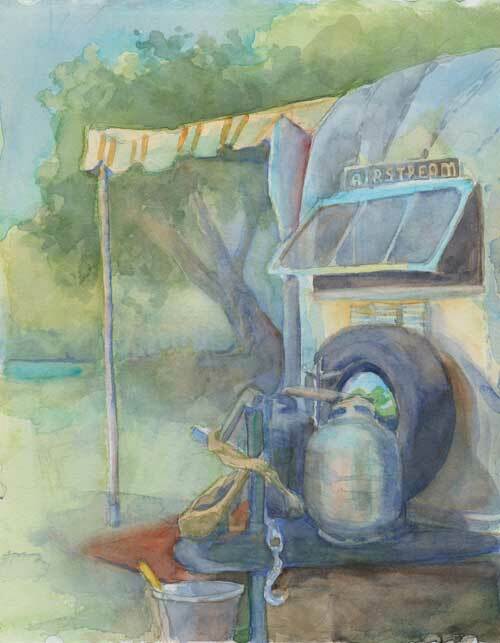 In the week after the Ironstone Concourse d’Elegance, we plein air painters who had participated in the event had the opportunity at the winery to display what we had painted. I chose to opt out. I had good intentions of submitting a painting, but you know the axiom: Wish in one hand…. I suppose I could have framed my sketches from the event. Here are the reasons I didn’t: 1. The pieces from the concourse were little more than sketches and 2. I didn’t have empty frames that size, so I would have to cannibalize an already framed piece. Besides, I was working on three large paintings to round out my own solo show at the Atherton Library in the Bay Area. But, ever attempting to be an overachiever (and generally failing), I put show preparation on hold and spent one long evening working on the above small painting. At the Concourse there is a group that calls themselves “Trailer Trash.” They are trailer collectors who drink cocktails in front of vintage Airstream trailers and teardrop campers circled on the lawn like Conistoga wagons. It’s a popular place to paint. In the late afternoon sun I sketched this little scene and made some mental notes while I sketched. And I snapped a few pictures with a friend’s phone (because my phone hates me and refuses to take photos). Let me tell you. A photo taken with a camera phone in bad afternoon light is not a good reference. In fact, I find that often photos aren’t good references at all. That’s why I keep my sketchbook closer to me than a dog keeps her fleas. Thank goodness I had that sketch and my notes about the scene. So with my bad photo, my good sketch, and my Swiss cheese memory to guide me, I painted all evening until the fiddler wandered down to the studio and wailed plaintively, aren’t you finished yet? (No, he didn’t really wail. Only his fiddle wails.) But at night he does often come to the bottom of the house where I struggle in my studio. He likes to walk me “home” (upstairs to the kitchen and living room). You never know when a mountain lion is hanging out under the deck, starving for a bite of pudgy artist. And I have to admit to you, at that point I gave up on this painting. There are many reasons to give up on a painting. Here are my reasons: 1. It was late. 2. I was tired 3. The painting wasn’t what I had in mind. 4. A perfectly good fiddler was inviting me upstairs for a glass of wine and some dinner. And most importantly, I hate being rushed. I know, we are all in a hurry these days. If something’s worth doing, it’s worth doing fast, right? And we’re all reaching for the stars, trying to achieve greatness, or at least trying to get someone to look at our artwork and expound on its loveliness. Or maybe just trying to get something painted and framed to hang in a last-minute show. I’ve said this before: I am a slow painter. I think too much, but it’s who I am. I need time to process and plan, to understand what I’m doing. This painting, quickly drawn and painted, was a good start for a larger, better painting. But not good enough to miss spending time with the fiddler.